MINI-TO-MINI…A perfectly unique MINI approach! This week marks MINI Cooper’s 51st Birthday! Happy Birthday MINI! Truthfully, MINI Cooper continues to extend the brand experience and offer magnificent examples of establishing global connections with a most perfectly unique MINI approach. Connectors do not always have to be in the form of b2c communications and certainly not focused on only one platform. MINI Cooper has created lasting MINI-to-MINI connections by investing in people and trusting them with the MINI brand. Encouraging MINI-To-MINI not only creates sustainable dialogues, but also nurtures MINI owners and their role in all things MINI. Sometimes the absence of the brand’s communication isn’t even noticed. MINI Cooper’s ability to strategically participate or stimulate discussion is brilliant. 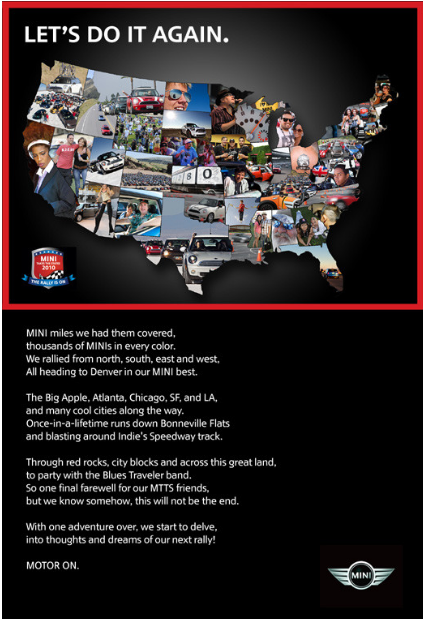 MINI USA shaped MINI TAKES THE STATES 2010 to proactively involve MINI owners. 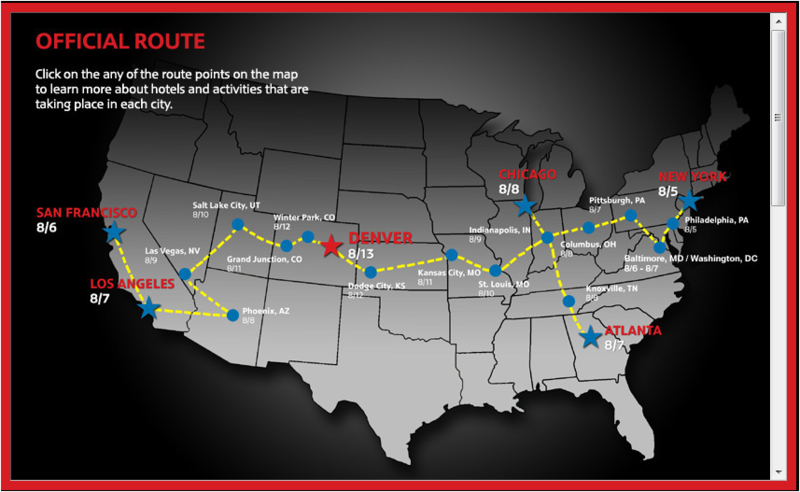 On August 5th enthusiasts motored their way across the US with a final destination set for August 13th for a motoring festival in Denver. The rallies started in five major cities and were led by a new MINI Countryman. The goal…Bringing people together – for the love of all things MINI. Personal accounts of “MINI Takes The States” created a genuine perspective of this motoring adventure. For those unable to attend, the personal MINI-to-MINI dialogues helped them to feel like a part of the celebrations. MINI Cooper ranks high among owners/enthusiasts that created personal social media spaces dedicated to a MINI life. Owners share experiences, ideas and suggestions. Even the MINIs themselves manage to connect on a regular basis. I was thrilled to take on the MINI Cooper exploration duties during the writing phase of Collaboration and Co-Creation. We highlight examples of MINI Cooper’s smartly coordinated 50th birthday events and their ability to inspire adjacent spaces though MINI Space. MINI Space is an urban initiative by MINI. People collectively participate in creative projects, competitions, events and parties. The mindset is nurtured and people do stay involved in “Creative Use of Space”. MINI’s capacity to simply connect creative people, helps them to offer emotional MINI-to-MINI connectors that a brand may not be able to offer. iMedia shares some great ideas for connecting via Facebook. Join us on the “New” Digg! Join Pallino1021 on the new Digg ! Why are QR codes important…NOW? A dedicated Green Builder, Decker Homes, is preparing for The 2010 Fall Parade of Homes in their local area. They have collaborated with several manufacturers to design and construct an “ideal” energy-savvy home and anticipate strong attendance. Traditional marketing initiatives have been outlined and are certain to serve @deckerhomes very well. Now it’s time to think about a mobile and social approach for sharing information and extending the experience beyond the tour visit. We have advised the use of QR codes for all printed material: take-alongs and stationary signage. Why are QR codes important? For small businesses we strongly suggest taking full advantage of mobile tools and the integration of social platforms. These tools not only extend the brand experience, but also enable sharing. Full use of location based tools for check-in would also be very good to see. In addition – Facebook ads will be targeted to identify those most likely to attend The Parade of Homes; as selected by local demographics and appointed to personal interests. How Do You Write Your Menu? Maybe because I was in the hospitality business for over 30 years, but I often reference things in a foodie kind of way. I have written many menus. Many, many menus! There is a knack to writing good menus. What do I mean by a good menu? You know. Sometimes a menu just doesn’t fit the ambiance, theme, clientele, location or just doesn’t seem to make sense for the restaurant that it is in. It may be a well thought-out bill of fare with delicious dishes, but doesn’t sell for one of the aforementioned reasons. A person (chef, owner, foodie) can put together a great collection of entrees that will tickle the most finicky critic’s palette, but if it isn’t the right fit for that particular setting, customers will not be moseying through your entryway. If you open an eclectic high-ticket bistro in a retirement community… you may have targeted the wrong crowd and are destined for failure. So what does all this menu/restaurant stuff have to do with your business? It’s about your menu! Are you offering the right product/service to the correct market? Do you have a great concept…but pitching it to the wrong group of buyers? If you are working on your passion in life, you want to make sure you are marketing and engaging with the correct set of dynamics for your project. Too often we have a great product/service, but are engaging the wrong sector through the wrong tools. Be aware of what you have, who you are promoting to, who will buy it, how much they will spend, how you will let the right people know, and what tool(s) you will use. It’s not just having an excellent product, but getting that message to the right people and interacting with them. Do your homework. Know the answer before you ask the question! Make sure you have a well thought-out scenario with all of the correct tools in place. Find your market dynamic. Then… Write a menu that fits your niche. For more thoughts on this…see our Emerging Trends Report. There is no doubt the role of images and the perception of sharing images has changed dramatically. Technology continues to inspire and enable the creative photographer within all of us. People are photo streaming the world around them. Connecting shared passion for more than images…but places, people and life. 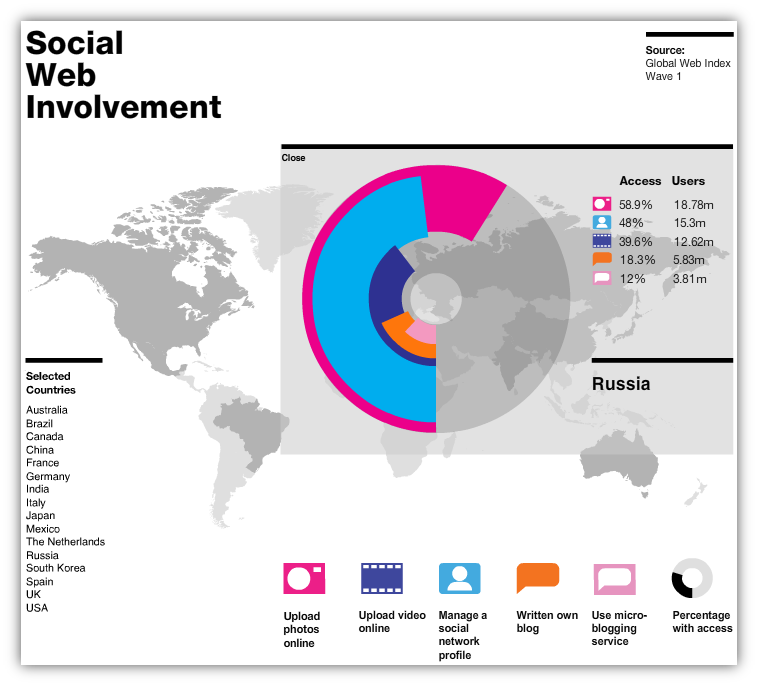 In some countries uploading images far outweighs other social interaction as people are tagging and sharing images at an increasing rate every day. Communication barriers are shattered with every event and every image upload. People-to-People…being naturally connected…without the disruption of media or other sources; allows them to create a personal evaluation of the event or place. Often, with a compassionate understanding of similarities rather than focusing on differences. Image upload – fosters stronger connections. Contests and social interaction, that encourages people to share images of the brand’s role in everyday life, does more than simply foster stronger connections with people. The context identified within these images can offer brands an incredible level of insight. 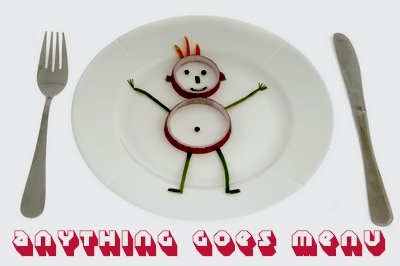 With receptive analysis, images can tell a new story of how brands “live” within real life. Image-to-Image…within many image sharing platforms the dynamic of connecting is completely unstructured as people move from image to image based on similarities, but as images often include multiple tags the journey can be completely spontaneous. Simplicity of sharing is built-in with Hipstaprints $1.99 app. The basic package has three lenses and incredible films, all with a standard flash, and enables you to shoot “RETRO” and send pics straight to Facebook and Flickr. Ludwig Zeller created the CubeBrowser as his diploma thesis “Audiovisual Media” while attending the Academy of Media Arts in Cologne. Images offer a compelling way to share data. I have used images to illustrate data in the form of Persona reports, a creative and often more enthralling way to share findings for data-based projects. But, the use of images and rich context within natural surroundings is an idea that we want to explore further. Images are an ideal way of communicating. Look for more in the coming days as we share a few more ideas about the role of images for truly understanding. As the next chapter of “Oprah” begins, we are reminded of what makes Oprah such an extraordinary blessing to those inspired by all things “O”! Listening…a unique and most humble of gifts. No doubt the future of Oprah will be even more inspiring, as the ability for people to connect has been embraced, and listening is already a key element of the process. and did, what I say mean anything to You…? Simply, why is Oprah Winfrey so Respected, Trusted and Adored by millions? “People Want To Be Heard” – Oprah Winfrey Digital Media teams may want to schedule a few Oprah sessions during the final season. Understanding why people need to be heard and just how to really listen, could offer far more value than any conference.